Here’s the deal on geranium care. There are two types of plants that most people refer to as “geraniums”. There are “true geraniums”, which are hardy, native and wild plants that make excellent groundcover and space filler in your garden and landscape. There are also Pelargoniums, which are more delicate plants hailing from South Africa. 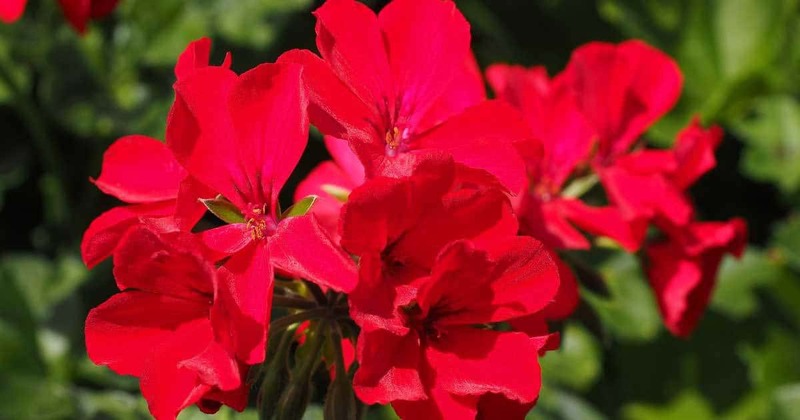 In this article, we will discuss both members of the geranium family and share some smart tips for their use and care. Geranium Plants – What’s The Difference? The plant that most gardeners refer to as a “geranium” is actually a Pelargonium. While this type of plant is quite attractive and useful, it is not a true geranium. Both the Geranium and the Pelargonium use to be in the same genus – Geranium. However, in 1789 they were separated into two genera. 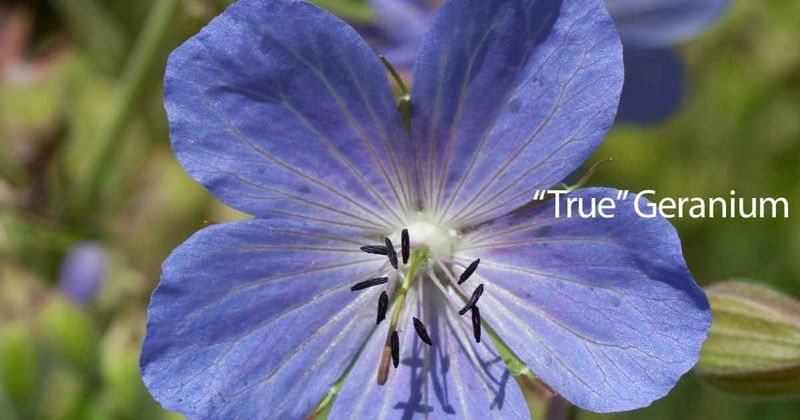 True geraniums are also called hardy, perennial or cranes-bill geraniums (because of the shape of their seed pods). These native or naturalized plants tend to grow low to the ground and spread quickly and easily via rhizomes. The leaves of hardy geraniums vary from one type to another; however, they are generally toothed and very lush and attractive. Flowers are dainty in shades of blue, purple, magenta, pink and white. Hardy geraniums are not as large as their cousins, the Pelargoniums. They are however, much tougher and can grow in more climates. They produce abundant attractive flowers and grow with such rampant abandon that they can even be used as a groundcover. Hardy geranium flowers are small but quite attractive. Their leaves vary in size from quite small (dime sized) to very large indeed. The hardy geranium is in many ways a far more interesting addition to your garden than the African Pelargonium. It can be grown year round in zones 8-10, and heights range from between five inches to three feet high. Hardy geraniums are, for the most part soft stemmed, herbaceous perennials that make an excellent addition to any garden. They are a fine choice for borders and for filling in space. They are tough and resilient and resist most disease and pests. They spend the winter season dormant and grow new leaves in the spring. For this reason, most varieties are able to tolerate temperatures as low as -20 degrees Fahrenheit. A few can even tolerate colder temperatures than that. Hardy geraniums are actually wildflowers, so they don’t need a whole lot of care. To care of true geraniums, you will need to prepare a well-drained, fertile, moist bed. Some types of true geraniums can be started from seed; however, you must start named varieties from cuttings. It’s best to do this in the early spring. If you do not get much rain in the summer, you’ll need to water deeply once a week. Mulching around the roots is helpful in areas where the summer is quite hot and dry because it helps keep roots moist. As wildflowers, these charming little plants tend to grow in an untidy fashion, so you may wish to prune them once during the growing season. Be sure not to prune too harshly, you’ll need to leave at least two or three inches of stem above the level of the soil. If you live in the deep South and have a lot of summer humidity and heat, you may have problems growing even the hardiest of geraniums due to a tendency to develop mold and mildew. Midseason pruning will help with this because it will allow good air circulation. Geranium macrorrhizum – a herbaceous perennial native to the Balkans and Southeast Alps. It’s also known as rock cranesbill, bigroot geranium and Bulgarian geranium. Although mainly cultivated as an ornamental plant, geranium macrorhizums also possess antimicrobial properties playing an important role in traditional medicine and aromatherapy. Pelargonium x hortorum – also known as zonal geranium, zonal pelargonium or garden geranium. This species is easy to grow and can be propagated at home through cuttings. Gardeners grow this to become a beautiful ornamental plant. Geranium cantabrigiense – another herbaceous perennial of the geraniaceae family with a common name of hardy geranium. It grows easily in a variety of habitats, attracts butterflies, and tolerates deer and rabbits. Geranium maderense – also known as Madeira cranesbill as it’s native to the Madeira island in Portugal. This evergreen perennial grows spectacular pink flowers and divided ferny leaves. Geranium rozanne or Rozanne geranium – a perennial plant that can grow through many climatic conditions. It is low maintenance and resistant of pets and many diseases. Your true geraniums will thrive if you place them in a bed that receives either morning or afternoon sun. Full sun all day long is a bit too much. Many do well in shady areas. For example the Coast Wildflower variety (Geranium maculatum) does very well in cool places with deep shade. This delicate appearing, yet tough wildflower provides a touch of color to shaded areas with its fairly large light pink flowers. Other varieties that do well in shade include Geranium endressii, which is also known as Wargrave Pink and Geranium nodosum, which has rather shiny leaves and pretty funnel shaped flowers that range from pale lilac to a fairly dark shade of pink. Geranium phaeum is another good choice for cool dark places. You may know this type of wild geranium as Samobor. It has dark green leaves with maroon flowers. All of these will thrive in partial to deep shade. For best results, prune enthusiastically during midseason to encourage new growth. Czakor which produces bold flowers that are deep magenta in color. These two types are very hardy and aggressive and have strong weed-smothering qualities. In milder regions, they will stay green all year round. Both of these are hardy in zones 3-9. 2. CONTAINERS & ROCK GARDENS: True geraniums are an excellent choice in containers or in rock garden. Ballerina is especially suited this purposes. This variety is hardy in zones 4-9. It produces large, showy pale lavender flowers that have contrasting burgundy veins. The leaves are an interesting and pleasing ash gray tone. Another good choice for containers or rock gardens is Nigricans, which is hardy in zones 8-10. This plant produces small, white flowers. 3. PERENNIAL BORDERS: For bright sunny locations, Cedric Morris is a great choice in true geraniums. It is quite showy with large leaves and pale magenta flowers. For contrast, you might want to also include the white strain of this variety. It’s flowers are bit larger. Pelargonium flowers are delightful house and garden plants that are easy to propagate and easy to care for. They come in a wide variety of types and flower colors. If you live in a temperate zone they thrive outdoors all year round. If you live in an area that freezes, you must provide them with protection in the wintertime. Pelargoniums are South African cousins of true geraniums. These are the plants you will find most often in your local nursery or home improvement center. Pelargoniums are very popular as both indoor plants and garden plants. Many varieties do quite well as hanging basket plants. In this section, we will refer to these plants as both geranium and pelargonium. The needs of these types of geranium are quite specific; however, once you understand them you will have no problem growing the plants that are known as common geraniums. They are relatively hardy and adaptable as long as their needs are met. Their needs vary depending upon the setting and the results you desire. For example, if you are growing geraniums indoors they’ll do all right in moderate light. However, if you want abundant blooms you will need to provide a great deal of light. Six to eight hours a day is best. Indoors, geraniums like a temperature ranging from 65-70 degrees Fahrenheit during the daytime and about 55° degrees Fahrenheit overnight. To do their very best outdoors, all African geraniums must have a great deal of sunlight. Six hours a day is the minimum. Some types, such as Regal and Martha Washington varieties, prefer afternoon shade in all circumstances. If temperatures in your area get higher than 90 degrees Fahrenheit, all types of geraniums need afternoon shade. Well-drained soil is a must for geraniums in any setting. They should be planted in a light potting mix consisting of approximately 1/3 soil, 1/3 peat moss and 1/3 perlite. Because Pelargoniums do hail from South Africa, they cannot tolerate freezing temperatures. If you are going to grow these types of geraniums outdoors in a non-temperate area, you should not put them in place until all danger of frost has passed. Prepare the bed well for good drainage and place your plants about 8″ to 12″ inches apart. Mulch around them heavily to help the roots retain moisture. 1. Be sure to establish your geranium bed in an area that receives a minimum of six hours of sunlight daily. In very hot areas, morning sun and afternoon shade are preferable. 2. Till the soil thoroughly to a depth of about 10 inches. Test your soil to be sure that it is slightly acidic. Geraniums like a pH level of approximately 6.5. Amend your soil as needed to attain this level. Good additions to the soil include compost and well-rotted manure. Your soil should be light and provide good drainage. 3. When planting your geraniums, be sure not to bury the stems more deeply than the original soil level as doing so will encourage rot. Once your plant is in place press the soil down firmly around its base. Mulch generously. 4. Once all plants are in place, water deeply. 5. Keep an eye on your geraniums’ growth pattern. If your plants become too leggy or tall, pinch back center leaf growth. This will force the plant to produce new growth from its base and the long stem. The result will be a more compact and full plant. 6. Fertilize on a monthly basis with a well-balanced fertilizer for the largest and brightest blooms and the thickest green foliage. 7. Weekly watering is advised. Allow the soil to dry thoroughly between watering. If the weather is very hot or your area is experiencing drought, keep a close eye on your plants and water them if you see signs of distress such as wilting. 8. Before first frost, take steps to overwinter your geraniums as described below. Even though this type of plant is sensitive to cold, general care is quite simple. Be careful not to over-water your geraniums as they will tend to succumb to rot and mildew if you do. It’s best to water no more often than once a week. Water deeply using a soaker hose or slowly trickling hose and allow the soil to become nearly dry before watering again. Avoid getting geraniums’ leaves damp because this can cause rotting, mildew and disease. Geraniums do usually need a high-quality fertilizer. Most experts recommend using water-soluble liquid plant food for houseplants. Outdoors, add fresh organic compost about once a month throughout the growing season. If you keep your geraniums indoors, you will naturally need to repot them as they overgrow their pots. If you see that your geraniums wilt between watering, it is an indication that it is time for a new pot. Whether indoors or out, deadheading your geraniums regularly will help encourage abundant blooms. Be sure to trim off faded blossoms regularly to make room for new ones. In areas that do not experience deep freeze, such as California, geraniums can grow and thrive outdoors all year round. In other areas, you will need to bring them in during the wintertime. Alternately, at the end of the growing season you can take cuttings and start them indoors during the winter. This will mean sacrificing your existing plants and replacing them with their offspring in the new growing season. The easiest way to overwinter geraniums is to sacrifice the parent plant and take cuttings that you can restart indoors during the winter. Here are some tips to help you do this successfully. Begin by making sure that your pruning knife or pruning scissors are very sharp. Cut three or four inch cuttings from the ends of branches. Pinch the lower leaves off of your cuttings. Coat the base of each cutting with a root hormone and place the cuttings in rooting medium consisting of coarse sand alone or mixed with sphagnum peat moss in small plastic or clay pots. The cuttings should be inserted to a depth that will allow them to stand on their own without support. Water your cuttings thoroughly and drape clear plastic over them lightly to prevent them losing water and wilting. Keep them in an area that has bright indirect light. They should root within a couple of months. Once they are well rooted, re-pot them into their own pots. As the weather warms up, begin acclimating them to the temperature outdoors. You can also overwinter bare root plants. This is very easy and usually has very good results. To overwinter bare root geraniums, begin by digging up your plants and shaking the soil off their roots. Hang them upside down in an area that will stay cool and dry (45-50 degrees Fahrenheit) consistently throughout the winter. If hanging them upside down is not an option for you, you can place individual plants in large, dry paper sacks. There are some advantages to this as a neater and tidier alternative. During the winter months, remember to soak the plant roots for one or two hours one time monthly. While your plants are over-wintering, the leaves will fall off. Don’t let this worry you, the roots are still alive. When spring comes, you can cut back all the dead and shriveled parts of the plant and replant the bare roots in the flower bed or in a pot. Be sure to wait until the weather is consistently warm before putting them outside. When the weather begins to cool, perform a fairly drastic pruning and transfer your outdoor geraniums to pots which you will bring indoors. Don’t wait until the first freeze! When temperatures drop to 45 degrees Fahrenheit, prune back your geraniums by approximately two thirds and put them into pots for the winter. While keeping your plants indoors for the winter, do not fertilize and only water lightly. Provide limited water on a weekly basis and keep the soil fairly dry. During the late winter months or early spring months, you will begin to see some new growth. When this happens, you can start fertilizing lightly. When the days begin to warm up a bit, you can start letting your geraniums sit outside a few hours at a time. Be sure to bring them inside before nightfall or anytime very cold temperatures are expected. This process will help your potted geraniums become acclimated to the outdoors. When all danger of frost has passed, you can move them out. At this point, you can either place them directly into the ground or repot them into larger pots or containers. Geraniums are an excellent choice for container gardening on patios, decks and balconies. The key to good container gardening with geraniums is proper preparation of the soil. This is the easiest way to get your geraniums established well. You should begin with a high quality of potting soil intended for container gardening. This type of soil is especially formulated to include materials that assist in good drainage (e.g. perlite, vermiculite and peat moss). To this add some good quality organic compost. Container geraniums need to be fed a couple of times a month. Use water-soluble fertilizer such as 10-10-10 mix or 20-20-20. About once a month, add a teaspoon of Epsom salts to a gallon of water to do your regular watering. This mixture will provide magnesium. Alternately, you can use a commercial slow-release fertilizer when you initially pot your geraniums. This will provide steady feeding throughout the growing season. Rather than giving your potted geraniums a little bit of water at a time, it’s best to water them very thoroughly about once a week. Water until excess water is running out through the drainage holes then wait until the soil is dry before you water again. It’s smart to do your watering in the morning to prevent the formation of mold and mildew. Potted geraniums need a bit more pruning than those planted in flowerbeds. Keep a close eye on the flowers and deadhead frequently to encourage lots of new blossoms. Pinch off all discolored and dead leaves and trim stems by about a third to encourage the growth of new branches. The geranium flowers serve as great scents. They also add flavor to different desserts and salads. The flowers are also good insect repellents, lotions, and creams. The leaves are also used to make herbal teas. Apart from its leaves and flowers, the geranium essential oils provide tons of health benefits. The geranium oil can help cure or alleviate hemorrhoids, skin wounds, psoriasis, eczema, nausea, diarrhea, poor circulation, rheumatism and more. It’s easy to see why the humble geranium is such a popular plant with gardeners across the board. With hundreds of lovely varieties to choose from in both true geraniums and Pelargoniums, the possibilities for landscape, garden, patio and household use are endless. Collecting as many different varieties as possible is an enjoyable and interesting hobby. Follow the advice presented here to start you collection and take good care of your geraniums.